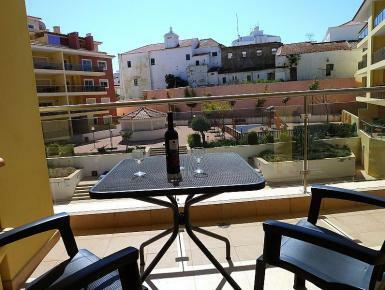 A modern one bedroom apartment in the Patio do Convento private condominium very close to the centre of Lagos historic town centre, marina and Meia Praia beach. This luxury apartment has a good-sized living/dining room, a well-equipped kitchen area and bathroom with jacuzzi bath with shower. The fully air-conditioned apartment is on the second floor serviced by a lift. The bedroom has twin beds that can be joined to form a double. A sofa bed in the living area allows up to four to be accommodated comfortably. Patio doors from the living room and bedroom open on to the balcony with built-in barbeque. The balcony overlooks the pool, terraces with childrens play area and old convent buildings.